Name Hero Review 2019: Is Name Hero a Good Hosting? The U.S.-based Name Hero might only have opened their doors in 2015, but they already offer fantastic web hosting products with enticing free services and cutting-edge new technologies. Name Hero officially started offering web hosting services in 2015. They have used their position as a new web hosting company to make exciting and valuable products and technologies, such as Cloudflare, Lite Speed, etc. an integral part of their offering. They are based in the U.S. with one East and one West coast data center. SSD Raid 10 secured storage: This type of storage is ultra fast and highly redundant to serve your data to users quickly and to keep it safe. Cloudflare with railgun: Cloudflare optimizes your content to load faster as well as protects your server from DDOS attacks. One-click WordPress install: You can get WordPress up and running quickly as well as choose a managed WordPress hosting service. LiteSpeed web server: This is one of the most popular types of web server software and is supposed to be much faster than Apache. You might feel a bit out of your depth using NameHero in the beginning just because it offers some advanced features. However, these software programs are popular because they are relatively easy to use. Between their tutorial videos, help center, and tech support you should be able to have no trouble figuring it out. Being able to work with either cPanel or WordPress is a blessing as it makes managing your solution easy and gives you full control. The pricing plans at NameHero are pretty straightforward. They offer solutions for shared web hosting, cloud reseller web hosting as well as VPS hosting, for those with more advanced needs, as well as E-commerce hosting. You can choose from a yearly or a tri-yearly billing cycle and there are a few upsells like a dedicated IP, external DNS, and ID Protection. One, six, or unlimited websites depending on your plan. Reseller hosting plans differ in the amount of allotted bandwidth (between 500-2,000 GB) and the amount of SSD storage (50 – 100 GB). You have access to all Superhero Features with all plans. The Corporate plan also includes a WHMCS starter license. Unfortunately, the only support channel available is through a ticket system. Even via tickets, their support staff is very quick to respond and seem to be working day and night. They also actively provide updates via the support center or social media. Their knowledge base and tutorial videos are some of the better ones so you can find the help you need yourself. If you want a hosting solution that provides you with access to the latest server and web hosting technologies and provides you with a few tools to make you more competitive, Name Hero might just be a perfect choice. Their free services and add-ons are also hard to ignore no matter if you want shared web hosting, VPS hosting or are a reseller. 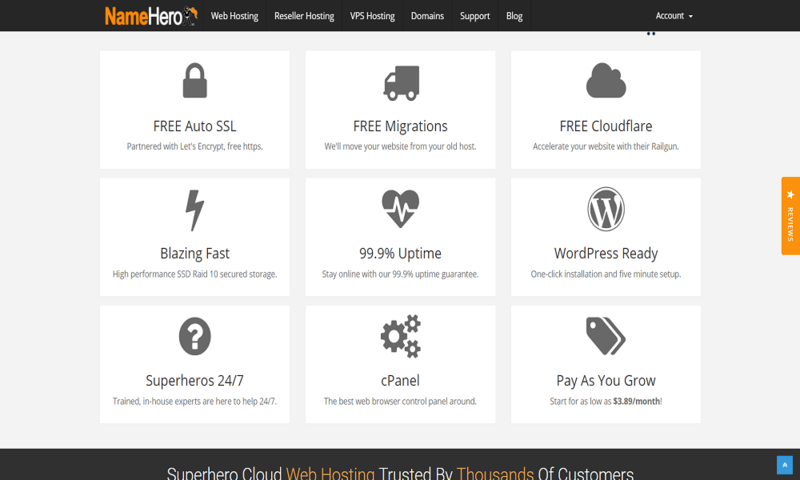 Wondering how Name Hero stacks up against other Web Hosting companies? Enter any other Web Hosting company and we will give you a side-by-side comparison.